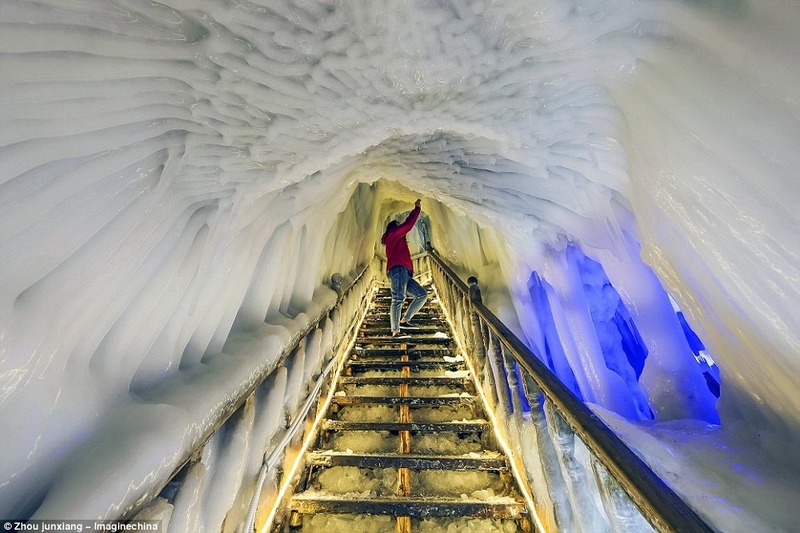 The Ice Caves That Never Melt, Even In Summer…. In the mountains of the Shanxi province in China, is the country’s biggest ice cave—an 85-meter deep bowling pin shaped subterranean structure set into the side of the mountain. Its walls and floors are coated with thick layers of ice, while large icicles and stalactites stretch from the ceiling to floor. The Ningwu Cave has the unique ability to stay frozen throughout summer even when the outside temperature climbs into the high teens. Across continental Europe, Central Asia, and North America are many such ice caves where winter lasts all round the year. The majority of these ice caves are located in cooler regions, such as Alaska, Iceland and Russia, where the year-long low temperature helps keep the caves naturally cool and frozen. However, ice caves also exist in warmer climates. Most of these caves are what is known as “cold traps”. These caves have conveniently located chimneys and exits that allow cold air to enter during the winter, but not the warm air in summer. In winter, the cold dense air settles into the cave, displacing any warmer air which rises and exits the cave. In summer, the cold cave air remains in place as the relatively warm surface air is lighter and cannot enter. The ice inside the cave also acts as a buffer that helps stabilizes the temperature inside the cave. Any warm air entering the cave is immediately cooled by the ice before it can cause any significant warming of the cave’s inside. Sure, it melts some ice, but the ambient temperature inside the cave stays pretty much constant. The reverse is also true: in winter, when very cold air cascades in, any liquid water in the cave freezes, releasing heat and stopping the cave’s temperature from plummeting too low. For ice caves to form there must also be sufficient quantities of water available over the right period of time. In winter the climate must be such that the mountains are sufficiently covered in snow, and in summer the temperature should be high enough to cause the snow to melt but without significant warming of the air which streams into the caves. There needs to be a delicate balance between all these factors for an ice cave to form and maintain itself. 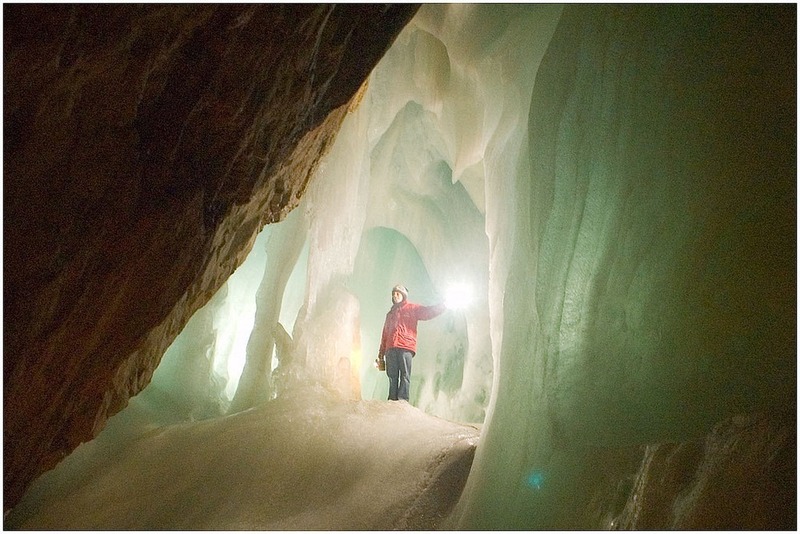 The Decorah Ice Cave in Iowa, the US, is one of the largest caverns containing ice in the American Midwest. The cave remains relatively ice free during fall and early winter. During this period, chilly winter air enters the cave and lowers the temperature of the rock walls. When snow starts to melt in spring, the melt water seeps into the cave and freezes upon contact with the still-cold walls, reaching maximum thickness of several inches in May-June. Ice often remains inside the cave until late August, while outside temperature breaks into the high thirties (high nineties for Americans). Previous Article Traveling by air? Watch for a glory….